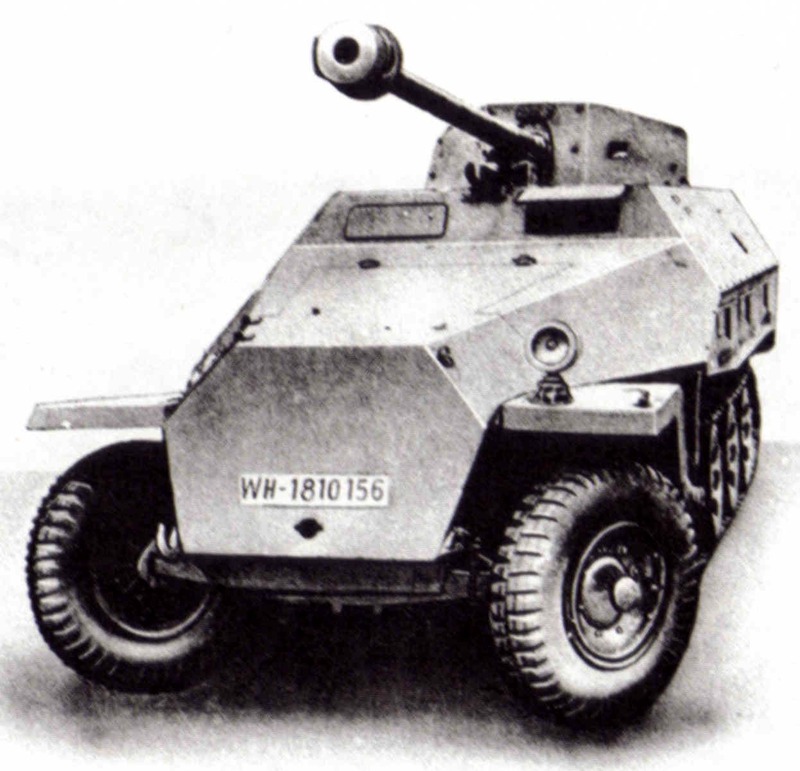 251/22 mittleren Schützenpanzerwagen (Pak 40 7.5cm L48) "Pakwagen"
From the US intelligence reports and the reconnaissance books comes this late version (single engine hatch, see Final body version). In the last stages of the war every available gun is put on any available mount to make a self-propelled weapon. Extensive attention of hitler, who thought that this was a key-weapon gave this version. 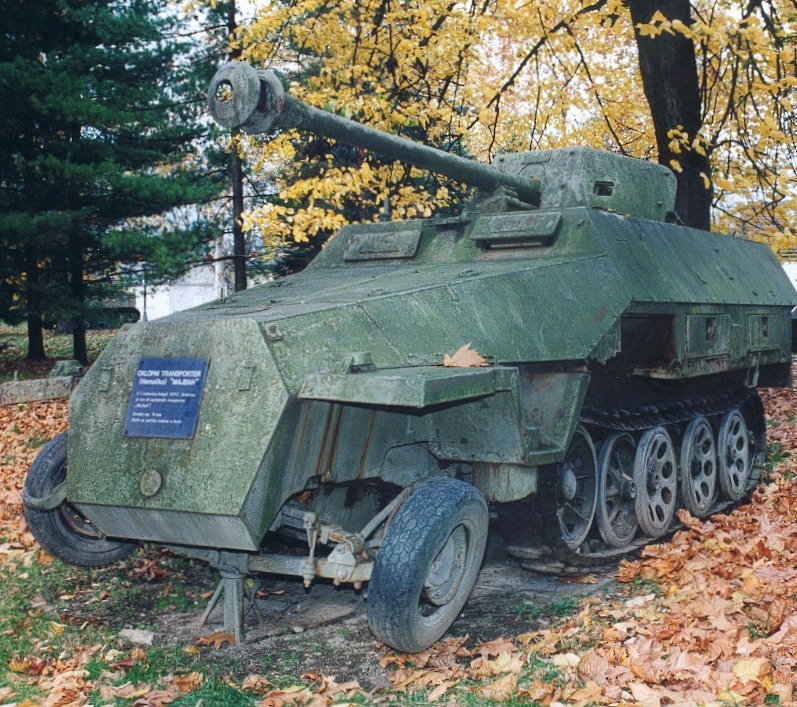 Even the towed version of the gun was produced with a trimmed shield to be able to be mounted directly. An overloaded chassis and a structure not designed for the strain of the guns recoil leads to many mechanical breakdowns. 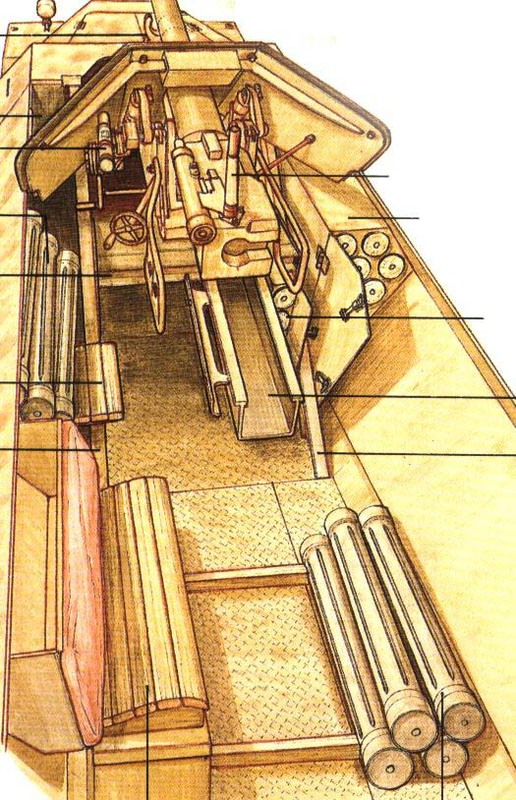 The mount of the gun is made by two H shaped beams welded to the floor roughly halfway the vehicle and the armor above the driver. A platform consisting of flat triangular plates holding a laterally piece of H-beam at half way carries the guns original undercarriage. From the front upper armor a half moon shaped section is trimmed. The left and right traverse is limited to 18 and 19 degrees respectively. The elevation is -3 to +22 degrees. From December 1944 the production has high priority. The gunner sits on a folding wooden seat to the left of the gun. The standard optical instruments are used. The gun has a travel-lock between the front visors. Both front benches and rifle-racks are removed. A bin of 17 to the right an one of 5 under the gun are constructed. Most crews carry extra ammo in loose containers. Sometimes in the left rifle-rack. Net Weight 8000 kg. The co-drivers visor is closed by a plate on the late production /D. December 2008 surprise: a front view reveling the double engine hatch and a pre-registration plate. Battered right front view, Medvode, Sentvid, (near Ljubljana) Slovenia, May 1945, photographer: Slavko Smolej. Observe the front hatches. With the few photo's available and the stage of the war I guessed that only the late version with the single piece engine deck would have been used. The picture in the sub-urbs and the new factory picture prove me wrong. They show a 2 piece engine cover, and a co-drivers visor that looks the standard one, not the closed one. 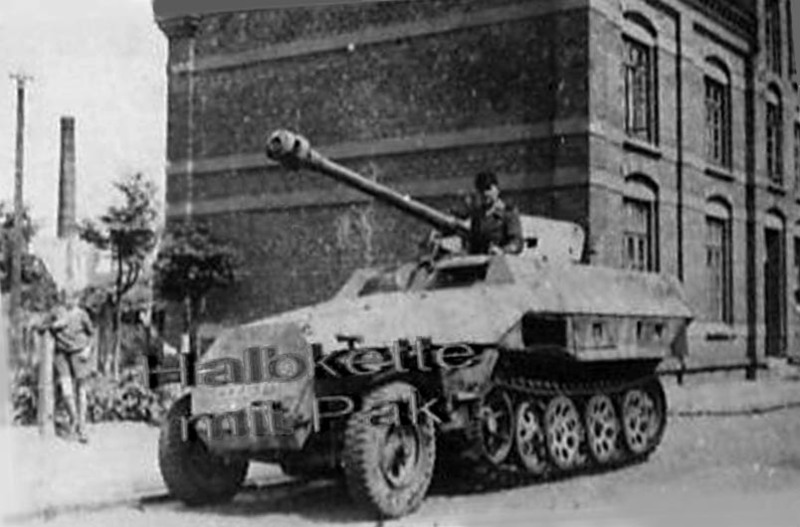 The Germans shipped sets to team a 251 and a Pak40 to a 251/22, so the suburb's picture could be explained by that, but the factory picture makes it official: the standard /D was used. The 1999 251 /D /22 Photo of the Banja Luka surviver by Bob Fleming, © Panzer Prints. (click the picture for the full story) and the photo in the outskirts. Notice the same damages? And the engine hatch? Can this be for real? It could actually be the same vehicle.